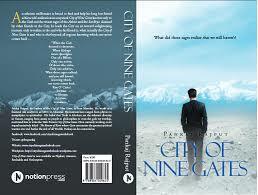 City of Nine Gates by Pankaj Rajput is a compelling spiritual tale, full of spirituality and psychological analysis, but also of irony has the power to change your life. The book is presented, both formally and in the educational objective, as a fairy tale with a happy ending. It tells the story of Gyan, a naive and young man who after a journey through city of nine gates transforms into a man who is aware of his potential, and above all of himself. It resembled a dreamlike world, inhabited by impalpable presences and supported by a knowledge that all involved. Everything in that kingdom resounded with his presence and men were part of it, like everything. Universal knowledge spilled every aspect of life. But it was not a material civilization, but a civilization of the mind. And the men who inhabited it experienced what was the practice of an extreme thought, of a world based more on the mind than on the visible. Then everything disappeared, engulfed by the unknown that the men held in high esteem. But that story sometimes returns to the next events, in the worlds and civilizations that will come later, until it touches ours and sometimes to enter it as a warning. Basically, the suggestions given to Gyan are almost trivial of practicing kindness, patience, generosity, precision, parsimony, simplicity, optimism, ambition, trust, concentration, use of appropriate language and loving all. The journey will inevitably lead to emotional serenity, and the benevolence towards everyone. For thousands of years’ humanity has been searching for answers on the origin and on the meaning of the universe. Philosophy, religions and science have only given partial and uncertain answers. No religion we know is remotely comparable to the Veda, whose traits went beyond worship and myth, to envelop everything, every gesture, every appearance. This ancient text contains the quintessence of the millenarian Vedic knowledge. Creation is described scientifically from a theistic point of view. In the Vedic literature some initiatory texts give us answers that go far beyond what culture offers us. In particular, the texts expose us to the origin of our and infinite material universes, explaining the reason for this manifestation. The texts are mystical and scientific at the same time and the reader will discover perfect material and spiritual truths. The soul will find in these verses, written in the most ancient language of humanity and of the cosmos, its own home and how to transcend the world of time to enter the games of eternity. The heterogeneity of the story written in the book by Pankaj Rajput involves the reader on several aspects of the narration. We can concentrate on the lives of the protagonists and the soul in the unconscious. The writer manages to show the dual personality of Gyan that is engaging but it is also fascinating and mysterious. The goal of the writer with this novel seems to be to tell a story that speaks of the inside and outside of each event and person, to explain what existence is. The text deals with intimate, common and normal human travails concerning the social condition that conditions our experiences and often traps. Through a clear and multi-faceted writing, the book makes the conscious unconscious, the implicit explicit and known unknown. The author is good at mixing the surreal with madness until you no longer understand where one ends and the other begins. Furthermore, there are profound psychological and philosophical deliberations that challenge everything that has always been believed to be true or right, to the point of shaking the very foundations of existence as we know it. Pankaj Rajput has painted a perfect picture of the reality that we live every day but that we are too busy to forget because it is taken for granted. In this testimonial the reflections of a man is presented with a very raw thought of reality, almost detached from it, I would dare to say. The author was able to express ordinary concepts under the eyes of a stranger whose vision is illuminating. Reading this book, it seemed to me, in a few moments, to lift myself from conventions, customs, and conformity, and I was able to observe reality for what it is. The author managed to construct a discovery, the one that will change our lives, the one that makes the stalls of the highest ecclesiastical powers tremble. I find the way of writing to be captivating, one of those that hypnotizes the reader. This book wants to inspire a profound spiritual change in the reader. In this book there are excellent teachings for life. I consider it a motivational book that makes you think a lot. The topics dealt with, regardless of taste, concern everyday life and the way we deal with things. The book offers us an intense and overwhelming novel, enriched by numerous and interesting anecdotes of modern and ancient art, architecture, philosophy and technology. It is a book told with a light and elegant style with the characterization of the successful characters and superb descriptions, which touches very profound themes existing since ancient times as the origin of man, or the role of religion in today's society. The curtains draw up. Lights are dimmed. The musical is about to begin. As the beautiful princess descends on stage, the mythical creatures from her kingdom come alive. Flickers of brilliant colours blaze across as mesmerizing music pulsates from one corner of the theatre to the other. A fairy tale is about to unfold in the #book… Does Appu ﬁnd what he had set out for? The answer lies in Rafﬂesia — The Banished Princess because in her story, lay his! These Circuses That Sweep Through the Landscape by Tejaswini Apte-Rahm is a #book with a collection of dark, twisty and funny short stories.